One of the most influential players of today's fashion world reached a pitfall on Tuesday. Revolve, a website devoted to retailing top designers in the fashion world, found themselves in turmoil when misleading pictures were leaked of their newest collection in collaboration with LPA. The senseless release and marketing caused an Internet uproar. Here's how things played out. 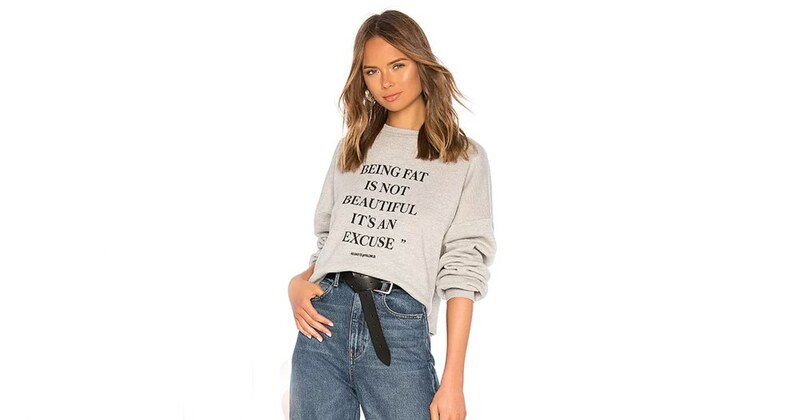 First, a photo of a sweater from the LPA x Lena Collection with phrase, "Being Fat is Not Beautiful. It’s an Excuse" circled around the Internet (photo above). The photo cropped the rest of the sweater's design and left out "as said to Paloma Elsesser." Revolve claims to have prematurely released the sweater on its website. This move did not go over well. Right after Revolve released this sweater and the leaked photo had been on the Internet for a while, the backlash began. Among the backlash were models, bloggers, and makeup artists who were not afraid to share their opinions. Many users argued that Revolve should not have put this product on their website or have it available for sale. Initially, the sweater and the complete collection (which will no longer be released) were created to combat shaming on women in society by using actual quotes told to celebrities. The sweater's message was unclear and seemed to portray the opposite of LPA's mission with this collection. The intended mission of LPA's collection was to incorporate critical comments that were said to women on social media into sweater designs. By doing so, LPA aimed to highlight the harsh realities of social media and how society often treats women in general. However, the quotes were placed in larger font while the byline of who the quote was said to was not visible. This layout convoluted the message and made the collection appear both fatphobic and ignorant. The derived quotes on the sweaters were said to major powerhouse women, such as Cara Delevingne, Lena Dunham, Emily Ratajkowski, Suki Waterhouse, and Paloma Elsesser. Shortly after the release and backlash, many of the women responded with their own criticism against LPA. One shocking fact: Lena Dunham confirmed that she had been working for months on the LPA collection with Revolve. She did not know, however, that the company would be displaying her sweater on "thin, white women." She then commented that she could no longer support the collection in an Instagram post: "Without consulting me or any of the women involved, @revolve presented the sweatshirts on thin white women, never thinking about the fact that difference and individuality is what gets you punished on the Internet, or that lack of diversity in representation is a huge part of the problem (in fact, the problem itself.) As a result, I cannot support this collaboration or lend my name to it in any way." London-based artist and social issues advocate Florence Given also responded to Revolve, speaking out to her followers to petition that the sweater be pulled from the website. Revolve saw this and quickly removed it from the website before they could make any sales on the product. LPA then canceled the entire collection launch in response to this controversy. On the same day, LPA's founder, Pia Arrobio, posted a public apology video in response to this controversy. She captioned her apology video via Instagram: "Our intention with this recent collaboration was to shine a light on the darkness of the internet by printing real-life comments that have been left on the social media feeds of women everywhere. The fact of the matter is that my intention does not match the negative impact it has had. To be clear -- we have never endorsed body shaming -- the goal was the exact opposite." Reactions to Revolve's public apology on Instagram had mixed comments. While some forgave the brand and wished the brand the best, others asked for more inclusive models to display the brand. With all this controversy, it's difficult not to see LPA and Revolve differently. However, it seems the public apologies from both Revolve and LPA did express regret towards the collection. The intent of the collection was to empower young women, but in conclusion, did the opposite effect. With all the controversy, there is some positivity in the fallout. Models, bloggers, influencers, actresses, and public figures all came together to profess just how terrible the sweater was. It was empowering to see all these women come together and defend being beautiful in all sizes.